The Lunaria is a leaf that seems to be made of silk but develops a sharp stem, like it wants to protect itself from the world. 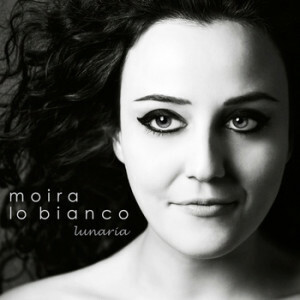 Framed by the essence of the Lunaria leaf, Moira Lo Bianco’s album Lunaria continues the delicate story of romance wrapped in the silks of classical, jazz and Middle Eastern styles. Sogno d’amore: hamartema is my understanding of love so far: sometimes scary, always dynamic. Marilyn is dedicated to the icon Marilyn Monroe, as a person in all her fragility, far from the image we are used to seeing of her. Signuri is a tribute to my hometown of Calabria, Italy, inspired by the homonym song written by Pippo Prestia, poet and songwriter. Polaroid(s) are three moments in life, fixed in my memory, indelible, like a photo. Funambolo is an image that became music – a personal sketch of a tightrope walker, a figure that, since I was a child, fascinated me.